Want to see the world and do a bit of goodness everywhere you go? Well, maybe you should book a ticket to Down Under and make Australia your next destination. Volunteering Queensland is signing up and helping to manage an influx of nearly 11,000 volunteers who have said they want to lend a hand to dig out the devastated northeastern Australia region from catastrophic floods. Skilled volunteers from all backgrounds are welcome, as long as they register with CREW (Community Response to Extreme Weather). Volunteer travel, volunteer vacations or voluntourism is travel which includes volunteering for a charitable cause. In recent years, "bite-sized" volunteer vacations have grown in popularity. The types of volunteer vacations are diverse, from low-skill work cleaning up local wildlife areas to providing high-skill medical aid in a foreign country. Volunteer vacations participants are diverse but typically share a desire to “do something good” while also experiencing new places and challenges in locales they might not otherwise visit. Combining a vacation or trip abroad with volunteering on local projects is one way you can immerse yourself in local cultures and make a difference. First, however, you need to ask yourself some serious questions to help decide where and what type of volunteer travel you’d enjoy. What’s your passion? Animal conservation? Teaching kids or helping them? Rebuilding homes destroyed by hurricanes or a tsunami? Are you willing to live and work with people whose culture and outlook is very different that your own? Can you handle living in a tent or shack with an outhouse or do you want to be in a hotel? [chuckles] A tent? A shack with an outhouse? Hmmm, just where the heck on the planet could I wind up? I suppose that might be a point I don't necessarily think about when I plan on travelling. Ha! I hadn't really thought about it; no, I have difficulty imagining it how life may be different, radically different in other countries. Last year, my wife and I had a two week vacation in Egypt (see my blog Egypt). As tourists, we had arranged to travel in fairly good circumstances but we did get an eye-opening look at what life is like in a third world country. According to the International Monetary Fund, specifically their statistics for 2009, Canada has a per capita income of $38,920 US while Egypt has a per capita income of $6,147 US. I find this comparison startling and I find it difficult to imagine how to interpret the difference between these incomes in terms of daily life. An Egyptian earns less than one sixth of the income of a Canadian. Unbelievable. I'm not sure that we fully grasp how well off we are in Canada and how the situation of other people may be radically different from ours. Consequently, question number one may be just how far do any of us want to go in volunteering? It's one thing to write out that annual cheque to the Salvation Army or the United Way; it's quite another thing to actually go down to the soup kitchen and wash dishes. You would have to be pretty soulless to remain unmoved by Africa’s current woes. Thanks to TV news, tales about Africans dying on an epic scale from famine, war and disease, seem to intrude almost daily into our comfortable lives here in the developed world. So what’s to be done? We can lobby our politicians about Third World debt (while accepting that their actions are rarely altruistic and are never as `generous’ as they appear). Or we can give to charities (while wondering how much gets through to those who actually need it). But there is another option: you can cut out the middlemen and go to troubled countries direct, offering practical service as a volunteer. But this, too, presents dilemmas. Earlier this year I fulfilled a lifelong ambition by spending a month as a volunteer in Tanzania with US-based Global Service Corps. I am in my mid-50s, now free of commitments that would previously have held me back. I am fit, and reasonably secure financially. So I signed up with GSC, as it is familiarly called, which offers volunteer programs in both Tanzania and Thailand, to work in a sustainable agriculture project. First hand experience of real poverty is shocking. It is difficult to understand what it means to have virtually nothing until you see it for yourself. More than ever I realise how lucky we are in the developed world to be born into affluence. Yet there is so much about the Tanzanian way of life that I envy. The generosity of people who have so little is humbling, and their politeness and concern for each other make our society seem greedy, selfish and uncaring. Perhaps poverty is better for the soul than wealth. But surely nobody relishes a life cut short by need and preventable disease. There has to be a balance, but where that lies is a question I will leave to others. In the meantime, I will cherish my link with Africa and the mutual, beneficial exchange it provides, while recommending volunteering as a truly life changing experience. My experience as a voluntourist was through the Habitat for Humanity Global Village Volunteer Program. I’m almost even hesitant to use “voluntourist” because we were primarily there as volunteers. 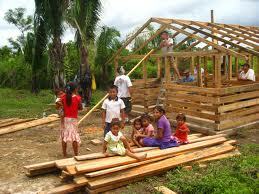 We were there to build a house, and we remained focused on that purpose throughout our trip. We spent our free time in the evenings and on one Sunday (our only full day off) exploring the city, trying local restaurants, meeting local residents, and sightseeing. It was a positive, memorable experience, and I hope to do it again in the future, either through Habitat’s GV Program again or another established, reputable organization. About.Com offers some interesting articles about the subject and one entitled "Decide If VolunTourism - - Volunteer Travel - - Is For You" should be mandatory reading for all of us in deciding if this is the way to travel. The author provides a list of 14 points to both mull over and work through so each of us can assess just what kind of volunteer work we might want to do. How long is the project? Where is it? What are the circumstances? How much work do you want to do as opposed to doing touristy activities? These are all good points and the success of any trip is going to come down to planning. Hmmm, yes I would like to do some good but is there a risk that the tour operator or the volunteer organisation is more about getting my money as opposed to me actually doing volunteer work which is contributing to making things better? Obviously I need to do my research before I decide to do anything. Years ago at university I became friends with a student from the Ivory Coast. He talked to me about his country and Africa in general. I've never forgotten when he told me to never donate to these charities which claim to be sending money for aid. He said it never got to the people who needed it. That was a pretty harsh condemnation of the western system of foreign charity. Or maybe it was more a condemnation of what was happening in the recipient country. I've heard there is a lot of corruption in some African states. Keeping that in mind, I would say that all of us need to investigate any organisation, any person we meet to ensure they are legitimate and trustworthy. As one source of information stated, make sure you contact people who have "already done it" and find out about their experiences firsthand. That way you can find out what's really going on. It's an intriguing idea. I've never done such a thing and I do not know anybody personally who's done this. Nevertheless, after reading that article about volunteering to help in cleaning up after the floods in Australia, maybe there's an opportunity to see the world and do some good. How Do I Discern Between ‘Good’ and ‘Bad’ VolunTourism?